The Inklings by Humphrey Carpenter – I got this for Christmas and it’s my next read, a group biography of JR Tolkien, CS Lewis and Charles Williams and writers of their ilk who used to hang out at The Eagle and Child in Oxford. Bulfinch’s Mythology – For dipping into at bedtime for dream material. I’m working through the Norse section at the moment. Subterranean by James Rollins – I read about six pages and couldn’t bear the writing style so it’s here to remind me to return it to the owner. Hindu Scriptures tr./ed. Robert Charles Zaehner – I have been meaning to tackle this for a while having read around Hinduism quite a lot, I particularly want to read the Upanishads. Strength to Love by Martin Luther King – This is wonderful for dipping into, inspiring and crammed with MLK’s powerful rhetoric and memorable turns of phrase. Lord of Light by Roger Zelazny – Classic SF book borrowing heavily from Hindu mythology. Very good. It’s here to remind me to return it to the owner. Curating Worship by Jonny Baker – Another book waiting to go back to its owner. I think it has been influential. I read it and was a bit “meh”. Vegan with a Vengance by Isa Chandra Moskowitz – Another one for dipping into, not as much for the recipes (which are great) as for Isa’s punk infused anecdotes. English Grammar for Dummies – Grammar is the main thing that keeps me awake at night so this is here for me to check stuff and get back to sleep. Breakout by Mark Stibbe and Andrew Williams – An account of missional communities based from St. Andrew’s Chorley Wood. The Seven Deadly Sins of Women in Leadership by Kate Coleman – Recommended to my wife by her spiritual director. Apparently it is very good. I can’t get over the title. Restoring Your Spiritual Passion by Gordon MacDonald – I have read some of this author and he’s pretty helpful. The Acts of The Apostles by Jimmy Dunn – My wife is doing a Masters in Theology and Ministry and was taught by Jimmy as an undergraduate. The Vision and the Vow by Pete Grieg – I think this is a book about “boiler rooms”, centres of prayer in UK cities. The Rest of God by Mark Buchanan – Presumably an appropriate bedtime read, I don’t know. Overcoming Fear, Anxiety and Worry by Elyse Fitzpatrick – My wife does a lot of pastoral work and is constantly looking to learn and improve. One Dog at a Time by Pen Farthing – Rescuing dogs in Afghanistan. I don’t think she has read this one yet but I have my eye on it, too. Run with the Horses by Eugene Peterson – I’m not sure what this is about but Eugene Peterson is one of the few Christian authors I can stomach. Tuesdays with Morrie and The Five People You Meet in Heaven by Mitch Albom – Classics, I believe, lent by a friend. World Without End by Ken Follett – Historical fiction. She is working her way through Follett at the moment. What is by your bed and why, and what does it say about you? I love it when people I enjoy let us into their lives a bit with personal things like this. Thanks for the permissible voyeurism. Freddy and Fredericka by Mark Helprin. I love his work. I haven’t been able to engage with this book yet, but will in time. I’ve read two of his other works and am jealous of his abilities. Steve Jobs by Walter Isaacson. Being in marketing and fascinated with Apple’s rise to the top, it’s a nice little cotton candy read. Do the Work by Steven Pressfield. Exactly what the title implies. So now I’m going to do some work. Hope you are well Seymour! I’m doing good, thanks, Andrew; pretty busy so not keeping up so well with blogging recently. Thanks for commenting and mentioning three books I had not heard of. The Steven Pressfield one particularly looks like the kind of book I’d like to check out. His book The War of Art is a must must must read. Hmmm … Interesting point about trying to make a book last as long as possible. I’m not sure I have ever done that although there have been a few that I was really sad to finish. Lloyd Grossman, too, such an odd accent and distinctive voice, I frequently hear him talking in my head saying things like “who lives in a house like this” when I am doing housework! I’d like them to bring back “Through the Keyhole”, it was brilliant. I think your wife’s reading is a lot more Godly than your’s! Tim’s are all leadership books and mine is more like your’s – only thus; various novels (all part read), knitting, child rearing and education! I don’t do much reading in bed (it wakes me up) so the books are there for other reasons, so I don’t lose them or so I can dip into them. The books I’m actually properly reading are elsewhere in the house where reading actually gets done. My husband’s pile: ‘Philosophy of Science’ by Alexander Bird (my former boss), of which he has read twenty pages and then got stuck; and ‘The Round Dozen’ by Somerset Maugham, which he does actually seem to be reading. My pile: ‘The Little Girls’ by Elizabeth Bowen; an Asterix omnibus for evenings when Elizabeth Bowen is just too damn wordy; and ‘The Crucible’, which I’m supposed to be teaching later today and should really be reading right now. Fail. Hurray for Asterix! I only recently rediscovered my Asterix books and spent a blissful afternoon with them; definitely goo bedside material. My favourite thing in Asterix is the faithfulness of the translation. For example, Asterix and Cleopatra preserves the following joke: Edifis, an Egyptian architect from Alexandria, says ‘My dear Getafix, I hope I find you well?’, at which Getafix, by way of explanation, says ‘An Alexandrine’ to the audience of puzzled Gauls behind him. The translators have not only understood the joke, but have contrived to preserve the Alexandrine (six pairs of poetic feet i.e. twelve syllables with a break in the middle) almost perfectly. Funny how little stacks of books form around the house, like flotsam. We have a pile in our kitchen and not many of them have anything to do with cooking. 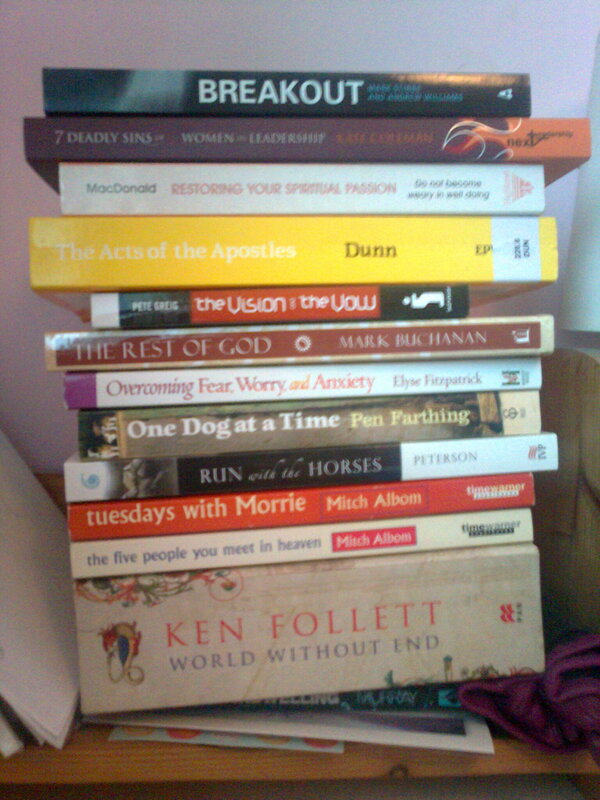 The stack on my desk is a bit random, too. Interesting way to peek into the heads of a couple. I see books on dressage, hunting, St. Patrick, and ancient battles, along with Suetonius and and a couple of novels on my husband’s side. Andy Goldsworthy oversize books, Shippey on Tolkien, KJB, novels and poetry on mine. Hello, Marly. Nice to meet you and thank you for commenting. I enjoyed looking at your blog, especially the “Faux-talks” – brilliant idea, I might steal it! I’m constantly having imaginary conversations with people I’ll probably never have the chance to meet. Fun idea. My wife’s reading pile would also include some Follett among others. Mine contains a lot of poetry right now: Auden, Dickinson, Wordsworth, Hopkins…you know, little known upstarts. Thanks for the keyhole look. 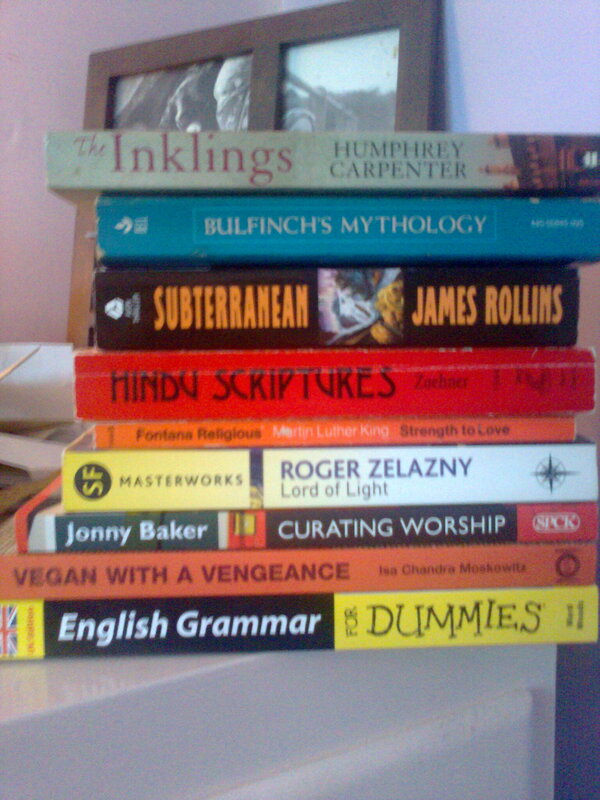 Quite a bunch of interesting books, and many I haven’t even heard about, so I need to check some of the out. And I think you are right, it’s always interesting to make a picture of someone by getting to know what they read. At the moment on my night-stand I have Do the Work by Steven Pressfield – as somebody else mentioned here, too, I have a novel by the Norwegian writer Chris Tvedt (the title is irrelevant if you are not Norwegian) and I have – of all things – I.O.U The Debt Threat and Why We Must Defuse it by Noreena Hertz. Interesting how “Do the Work” came up twice in the comments.It seems to have mixed reviews on Amazon – people either love it or hate it. I think I might like it, though ….